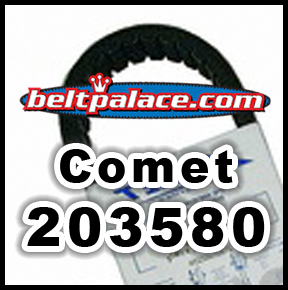 Comet 203580 (A-DF) Go Kart, Mini-Bike Belt | Comet 20 Series 884-80DF Belt | Used in Mini Bikes, Golf Cart, Scooters, and ATV's. COMET 203580 (A-DF) - Comet OEM SPEC BELT 884-80. Symmetric Belt. Manco Buggy 4292 belt. Comet 203580 (A-DF) Go Kart Belt. Replacement belt for Comet Industries 884-80, COMET 203580 and 203580A. Replacement for 884-80 OEM Torq-a-verter belt. 3/4"top W x 29 9/32" L. Symmetric Cogged belt. Also used in parade Mini-Bikes, ATV's, Golf Carts, and Power Scooters. Comet 219463A Driven Clutch (Assembled). Replaces OEM Model# 21-D. 6� Dia. with 3/4" BORE. REPLACES Previous Comet 217776A clutch. Comet Industries part 219463A replaces worn out or broken Driven clutches on Comet 20 Series systems used on Manco, American Sportworks, Murray, Stens, Kartco, and Salsbury clutch assembly. This fully assembled Driven (axle) or �Lower� Clutch is the Comet replacement part #219463A (previously 217776A ) for Comet/Hoffco/Salsbury clutches on Go Carts, Golf Carts, and Mini-Bikes.